As a mum of two I have had my fair share of disasters when it comes to dressing a newborn. From loosing endless amounts of socks to nice outfits getting ruined from poo explosions. Before having Amelia I bought a ton of pretty little outfits and truth be told I think she only ended up wearing one of them! So when the time came to start buying for the little mans wardrobe I had learnt my lesson and went for practical instead of going overboard. Persil Non-Bio and Comfort Pure recently conducted some research into the top baby blunders when it comes to dressing babies and have partnered with a number of parent bloggers, including myself to give our top tips to help combat baby dressing blunders. 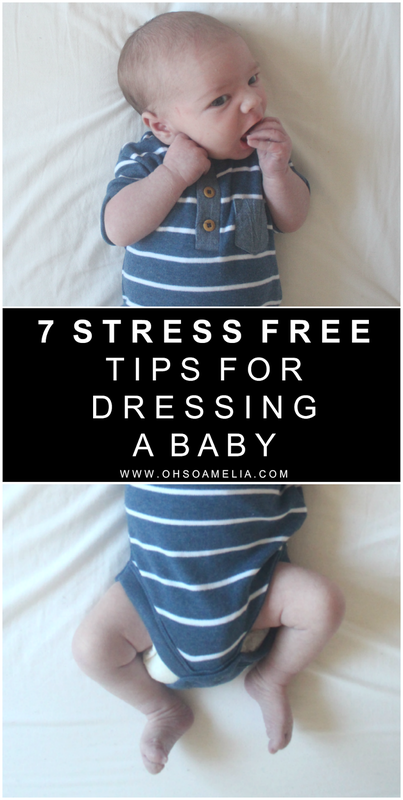 There are of course many newborn staples which I bought the second time round which were totally invaluable to myself as a parent so I thought I'd share my top stress free tips for dressing a baby, although I do still get it wrong sometimes! Did you know that you can roll down the onesie over the shoulders instead of pulling it up over babies head? Gone are the days of nasty poo explosions which end up in babies hair, all of the floor, yep you get the picture....everywhere!! Persil Non Bio and Comfort Pure are perfect for getting clothes clean, so a controlled mess is definitely something to aspire to! Stock up on sleep suits with the scratch mitts built in, not only will they stop your baby from scratching their face they also keep baby's hands nice and warm. Trust me - you'll only end up loosing the scratch mitts as they are always far too big or your little one likes to pull them off. Yes they may be cute but honestly they don't need them! Instead stock up on some snazzy socks with cute designs! I bought a dozen pairs of baby shoes for Harry which are all still sat in the cupboard, I didn't learn my lesson from buying too many with Amelia either but it's something I tell everyone who's having a baby! This is something I learnt when my eldest was a baby, she was forever pulling her socks off or her tights would end up around her ankles especially if she was wearing a dress or skirt. Keep your baby's tights up by putting them under their vest instead. This will also mean no missing socks when out and about resulting in looking like you forgot to dress your baby. Also, boys can totally wear tights too! They're especially handy in the winter for keeping little legs warm! If possible avoid buttons on baby clothes especially ones with shaped buttons or really small ones. They are not baby friendly! Before you even have the chance to do one of them up your baby will have tried to wriggle away. Not only are they fiddly, they are time consuming... I can put on an outfit without buttons 5 times faster! Dressing your baby can be a lot of fun especially with all of the adorable clothing available these days with cute designs and patterns. But let's be honest, your baby doesn't care, they are happy in something simple and comfortable. Unless you're certain you're having a 10 pound baby be sure to buy clothes in a few different sizes, I was always told not to bother with newborn sized clothing as your baby grows out of them so quickly which was the case for Amelia but Harry was rather small for his weight as 0-3 month clothing was huge on him so I had to go out and buy newborn once he had arrived. Do you have any baby wardrobe blunders to share? * Sponsored by Persil – all opinions in this post are those of Oh So Amelia and not Persil. For details on how I work with brands take a look at my work with me page. I do find tops handy with 2 buttons on the side. It makes it easier to get the top over the head. Other than that stretchy tops are brilliant too. For girls now I prefer leggings to tights. Buttons on baby clothes seem so unsafe, too - it's all too easy for them to shove them in their mouths! For a new mother it is quite essential to learn some crucial facts on how to take care of their baby; therefore it is essential for every mother to learn some crucial facts from experts and different sources. Here from this article we have found some effective tips on how to dressing or baby without any stress. Thanks for providing such a wonderful article. Thanks for share your idea. I like your idea.